﻿﻿Why summer reading? Because it will prevent summer slide (a loss of learning when not in school). Summer reading programs are essential in closing the achievement gap and preventing reading level loss. Studies show that participation in a summer reading program raises student reading levels, particularly for at-risk youth. Summer learning loss is cumulative. 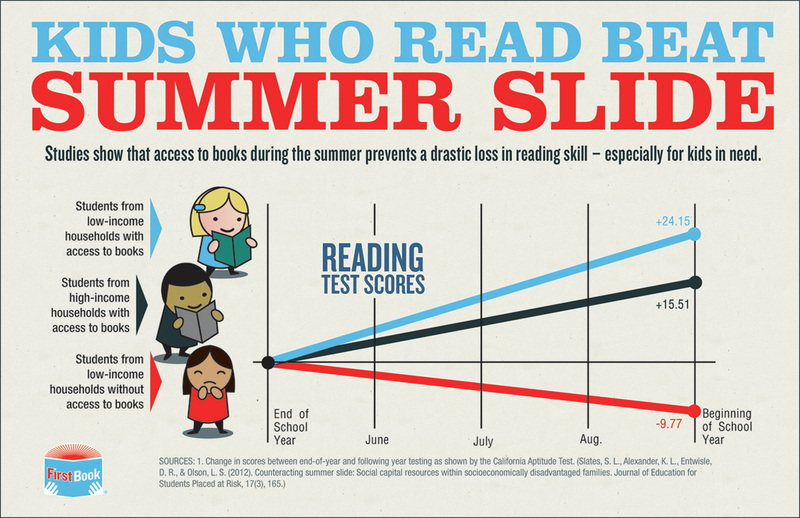 By the end of 6th grade, children who lose reading skills over the summer are two years behind their classmates. SRP develops good habits – like using the library to improve reading skills, and love and enthusiasm for reading, especially in multiple formats. Students who participate in SRP score higher in reading achievement tests at the beginning of the next school year than those who do not participate. According to the Wisconsin Department of Public Instruction, reading just five books over the summer prevents reading loss. Teachers have reported that the most dramatic difference between students who participated was in their enthusiasm for reading. The more children read, the better their fluency, vocabulary and comprehension. Readers Are Learners! The more your child reads, the better reader, writer, and speller he/she will become. Library reading programs help kids discover what they like about reading, for free! Parents, caregivers, and other adults can help stem summer slide by reading themselves, as children that see adults in their lives reading often tend to read more themselves. Patricia A. Lauer et al., Out-of-school-time programs: A meta-analysis of effects for at-risk students. Review of educational research 76, no. 2 (2006): 275-313. Jennifer S. McCombs et al., Making summer count: How summer programs can boost children's learning. Santa Monica: RAND Corporation; 2011: Monograph Report 1120. James S. Kim and David M. Quinn, The Effects of Summer Reading on Low-Income Children’s Literacy Achievement From Kindergarten to Grade 8 A Meta-Analysis of Classroom and Home Interventions. Review of Educational Research, 83, no. 3 (2013): 386-431.